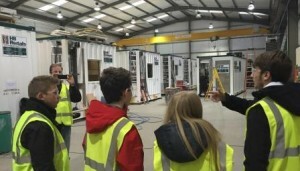 Last year TEC Offshore became involved in a project with Breadalbane Academy, the local school in Aberfeldy, to assist youngsters aspiring to become engineers. As part of the engineering project set by TEC, the students travelled to HB Rentals in Aberdeen last Thursday (07 January) with Gordon Leighton Snr and Jnr to continue their studies with real hands-on experience. The initiative is part of EDT Scotland’s STEM (science, technology, engineering and mathematics) enrichment programme which TEC Offshore is proud to support.